(62,000 words) Sequel to Quicksand. A traitor within USTECH has sold time-travel technology to the Chinese, who have sent agents to the past to intervene in history. The US president must also intervene to prevent major world catastrophes from occurring. In the year 2040, the corrupt and tyrannical Chinese government nears collapse. Aiding their fall is one of the world's richest men, Milton Black, a westerner also known as "the Pacific Baron". Black has pursued the Chinese government and people with unrelenting vengeance for decades, using his great wealth to engineer financial chaos there. With the Chinese government's demise imminent and in an effort to escape retribution from their own people, certain top Chinese government officials prepare their escape. With the assistance of a corrupt and unknown American, the Chinese have managed to steal time travel technology (called TEGAN) from the American installation, USTECH. They then send two of their agents to the year 2004, where those agents hire a salvage vessel to pre-empt the discovery of a huge haul of Nazi gold off the eastern coast of Australia. In original history the captain of the salvage vessel would have found the gold soon after the Chinese intervention. The theft	of the gold is done in preparation for the remaining Chinese officials who plan to escape their crumbling empire by fleeing to the past. However, in 2040 the US government finds itself with more problems than just the rouge actions of the corrupt Chinese government. Powerful electromagnetic pulse waves, or RIPPLES, are striking at random across the east coast of the US, disabling almost all electronics and bringing with them aircraft and ships from the previous century. These are flights which had disappeared within the Bermuda Triangle over a period spanning a hundred years or more. These craft have been carried through time by huge electromagnetic forces, the result of natural magnetism within the triangle that have been boosted by the enormous man-made magnetic forces generated during the "Philadelphia experiment" in 1943. Sadly though, with virilent automatic defense systems of 2040 on alert due to the RIPPLES (especially at a time of Chinese instability), none of these aircraft or passengers survive, being downed instantly upon arrival. Christian President Will Forrest plans to wait until the Chinese government is falling under a peoples' revolt, and then attack the Chinese time base hidden beneath the Great Wall. Forrest must risk nuclear retaliation to halt the Chinese threat. He must also face the added threat posed by the traitor within USTECH, and those who have already gone to the past to interfere with natural history - something that he has learned immeasurable immeasurable and catastrophic consequences. In 2004, the two Chinese agents on board the salvage boat Sea Bed finally recover the Nazi gold. Knowing the Americans of 2040 are pursuing, they know they must move quickly or risk capture. While in 2040, the president of the US must take decisive action or risk having his nation spiral into turmoil and utter destruction. The tension builds towards a violent and thrilling climax. The plight of the tiny Cessna would have proven infinitely more interesting had any of the guests thought to watch its departure through binoculars. Just as the plane passed from the ability of the naked eye to see, it seemed to pass through a wave of distorted air. The wave had little aerodynamic effect on the plane, its two passengers barely noticing the small bump it caused. They placed the blame for the shudder on the already faltering engine. But to an observer, had there been one, it was as though the atmosphere was curved at that point, and one's vision along with it. For a brief moment it was as if the plane was being viewed through a curved lens. The plane did not dive. But in the twinkling of an eye, it simply vanished. ??? gurgled and the tips of her fingers quivered as blood from her face and the back of her skull slowly dribbled down among the keys. The small sizzling sounds from within the monitor became less audible, slowly but surely decreasing, until they ceased. They seemed to be acting as some kind of metaphoric indicator, bearing witness to the life that slowly drained from ??? 's body. Without notice or any trace of warning, Ivetta No stepped forward and lowered her weapon at the larger of the two crew, Tony Barren. There came a low muffled burble from the dull green gun, and she opened up the chest of his wetsuit. ????? seized ????? tightly by the upper arm and brought a heel down heavily on the back of one of her calves. She dropped with a thud to her knees and whimpered in pain. ????? in turn brought his heel down hard on her calf muscle to prevent her from moving away. Then he let go the arm and took a bundle of her blonde hair and lifted hard, holding her upright. He pointed his gun at the side of her head, the silencer beginning to mingle with her hair. Tears of anguish flowed from the hardened ????? 's eyes. "Mister... please! Don't hurt her, please! I'll give you the number. Please! Just don't hurt her!" ...the president prepared to leave, desiring to know the progress of every minute. "I'm sorry, Lou, but my decision is made and my chiefs concur. In any case, you'll know whether I am right soon enough." Like the voice of doom - a death knell - the computer's cold and emotionless voice echoed the tragic words of condemnation in Lou Fredericks' ears. "Twenty-two minutes to initial strike." Caught in the crossfire of the two Chinese, the intruding agent found his arm wrenched away from his face by another burst of crashing lead. Before he could return the injured arm to its place, he felt something crash into his forehead, this time even more cruel and damaging than before. He fell face first to the deck, and never did it occur to him that he was dead. Kriesler read the words about how God had restored and multiplied Job's fortunes, and wondered if God could do that for him. It penetrated his mind with small rays of hope to think that God might set him free from prison. But how much could he hope for? After all, surely all was lost already. "And the attack on China...?" "It's happening as we speak. There is no lie... several hours ago there began a civil uprising in China. The people, the armed forces, everyone is revolting. The entire leadership, as best we can tell, has fled, Lou. So for these few hours the nation is without clear leadership. Just for a few hours we have a window of opportunity when they are vulnerable as never before." "So you are going to declare world war...!" "I will make myself a curse to your people forever," he seethed and gurgled through blood stained teeth. ????? did not reply. Already he could feel a hollow weakening feeling growing within his chest and stomach and he knew instinctively that his heart had been compromised. It felt as though his intestines were falling from his body, as his mind immediately began to lose its sharpness. 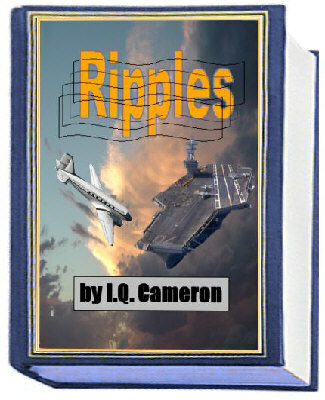 Purchase the surprising conclusion to Ripples.